fish – "After all it was a great big world… with lots of places to run to." Last weekend, I wanted to go on a day trip. On a budget. And what does that mean? That means take the subway to the last stop, and see what’s there. 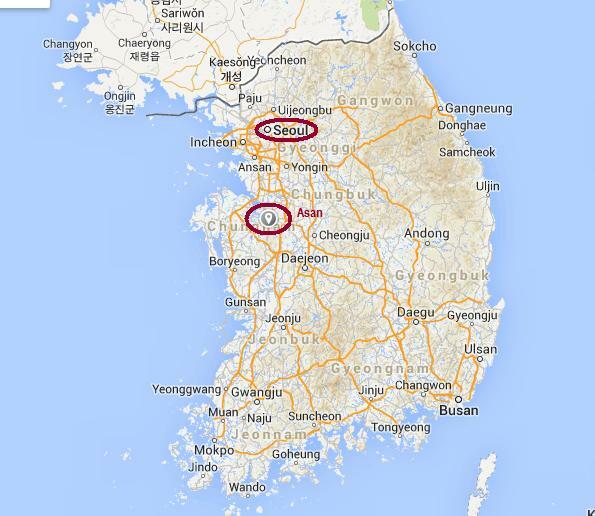 I did this last time I lived in Korea as well, but the subway line has been extended considerably since then. To give you an idea of how far- here’s a handy map! So, still riding the Seoul subway, it’s pretty far! What a deal to be able to travel that far for less than $2. Korea has figured out this whole public transportation thing. Now, because it was a day trip, I planned on getting up early, and biking to the train station, and then spending the whole day exploring Asan. However. Because it was the weekend, I ended up sleeping in and then deciding just to walk to the station. This ended up being to my benefit, because I met a friend along the way, and ended up having an exploring buddy. Always nice. The train ride to Asan took about an hour. The best part of it was the fact that we had seats on the train the entire way. Not standing for the entire hour? The day was already a win, and we hadn’t even gotten there. Now, in true me fashion, my planning for this trip was… lacking. 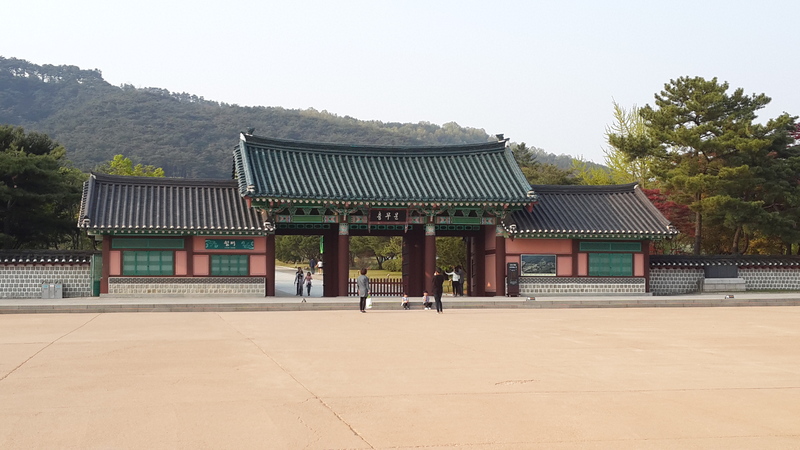 I briefly went on TripAdvisor, and looked at the major sites, and decided what I really wanted to go see was Hyeonchungsa. It is a shrine in the north part of Asan, and from the pictures and comments, a beautiful place to relax. So, that made up my mind, and i didn’t really see exactly where it was located. 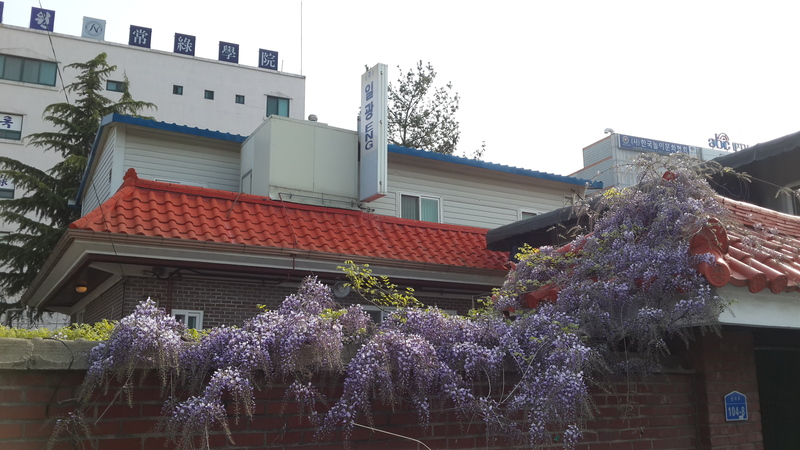 Turns out, the shrine is about 6 or 7 Km from the nearest subway station. But it was a beautiful day, so we decided to have a nice walk. The first part of the walk was not too exciting. 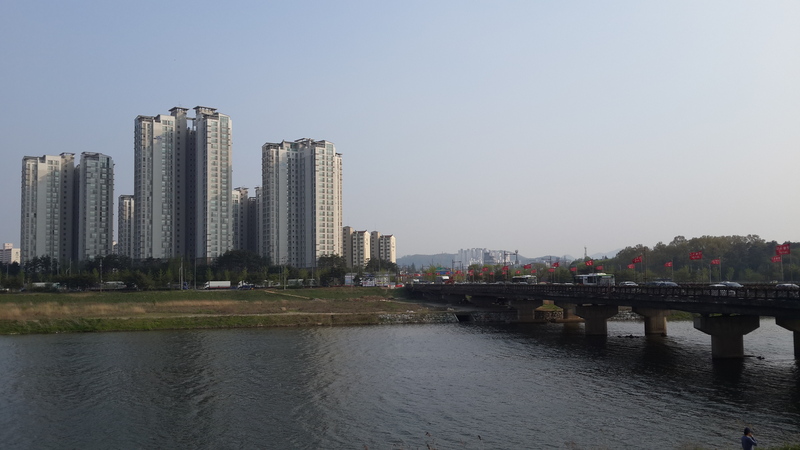 Mostly through the city, it was pretty much like most other Korean small cities. Though we did notice an abundance of bowling alleys, and that all of the sports fields and equipment were spectacularly well kept. 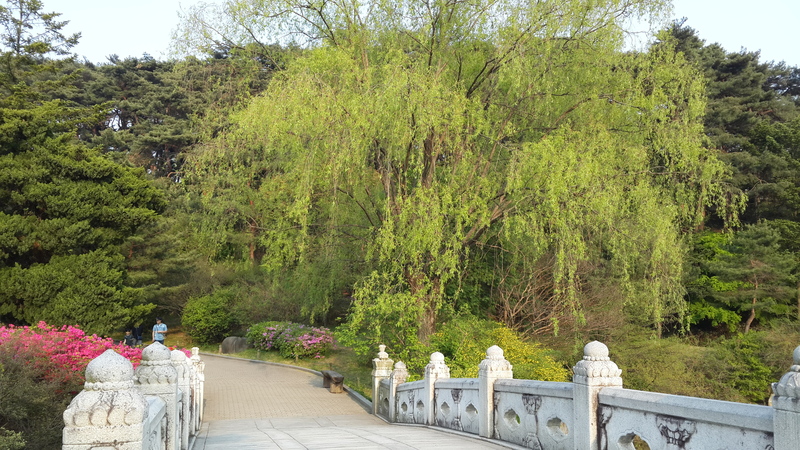 Our path to the shrine took us to a lovely bridge over the river. 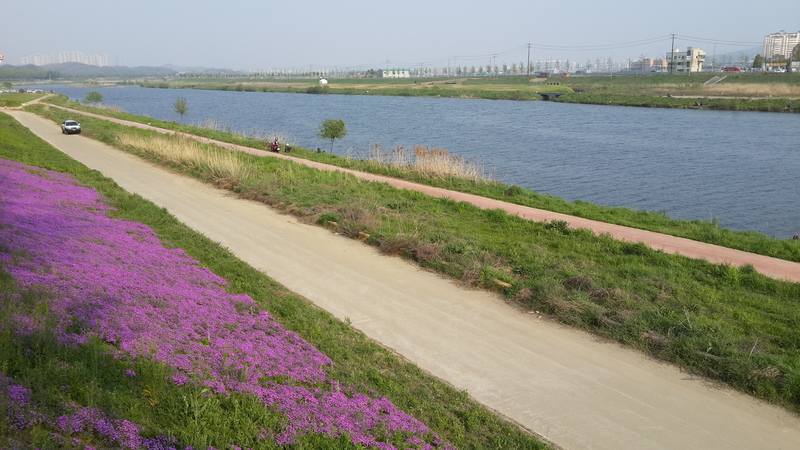 The river here, like most rivers in Korea, had walking and biking paths along both sides. But unlike in my city, this river was actually quite picturesque. 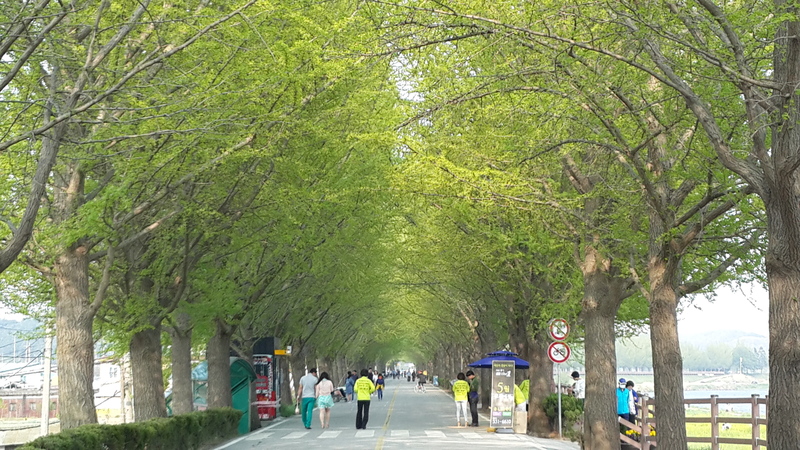 Running along the river, there was a pedestrian street that was really beautiful. I can only imagine how gorgeous it would be in the fall. 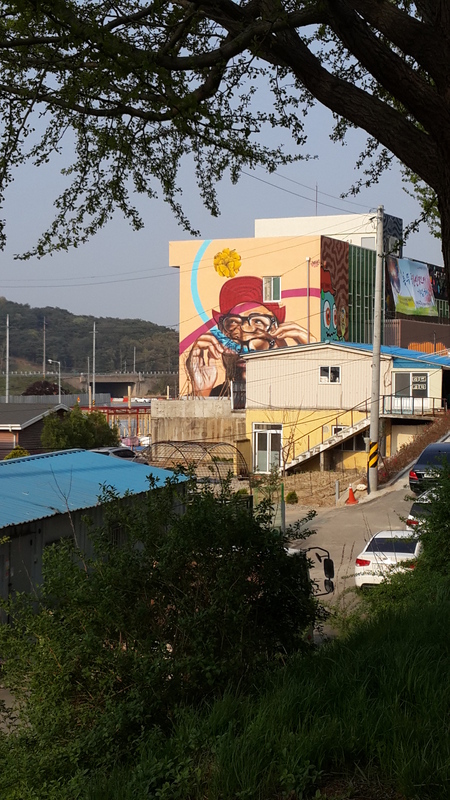 After walking along this pedestrian street for awhile we came to a building with some really cool artwork on it. Even better news (for me) was that in front of this building there was a street busking festival. 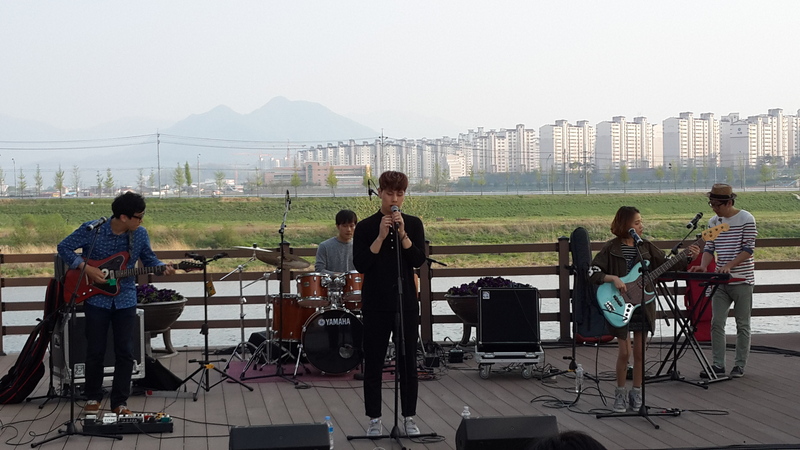 So we stayed for a bit, and watched the band. Now, we didn’t stay long… because the late start, plus the hour train ride, plus the 5 km walk, meant it was already almost 4pm. Add to that, the fact that we were still at least a kilometer or two away from shrine, and that most temples close around 5pm, we had to get moving. We finally arrived to the intersection outside the shrine and I was a bit dismayed to see the unending line of cars waiting at the light to leave the shrine, and NO cars going to it. Fearing it was closed we walked up the long entrance way, and were happy to see that the gate was still open! In we went, and almost immediately, it was so unbelievably peaceful. 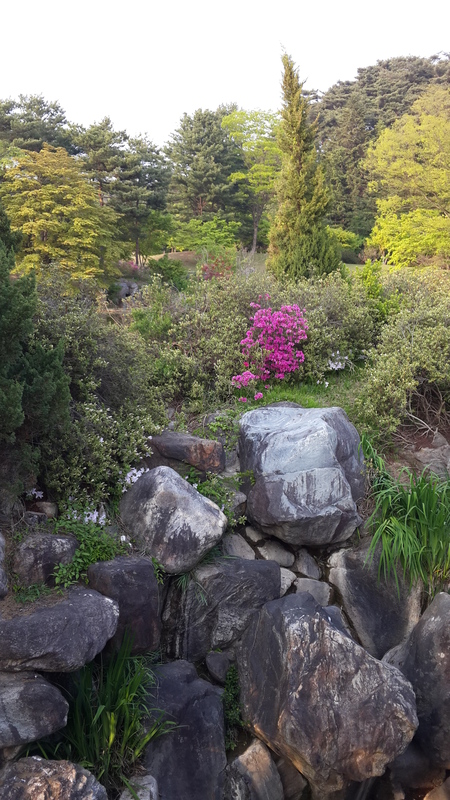 We walked around the grounds for awhile, and I was actually happy that we had gotten there late. Most people had already left, so it was not crowded at all, but there were still some people around, so we felt like it was ok to still be there. 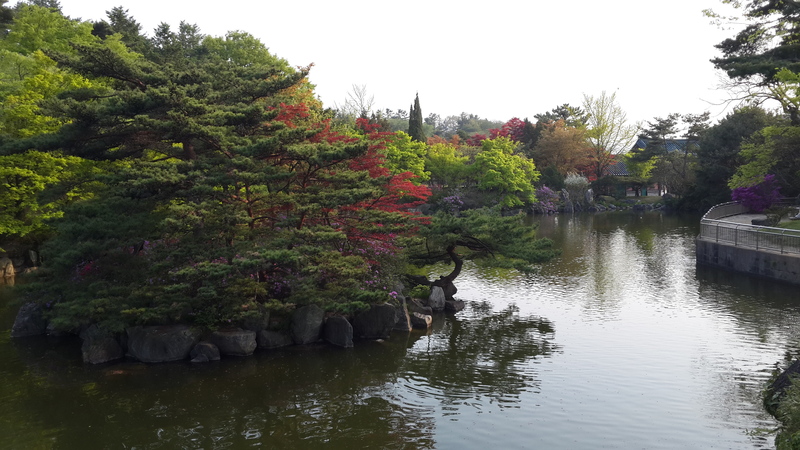 There was a large pond, surrounded by different colored trees and flowers, making it really beautiful. 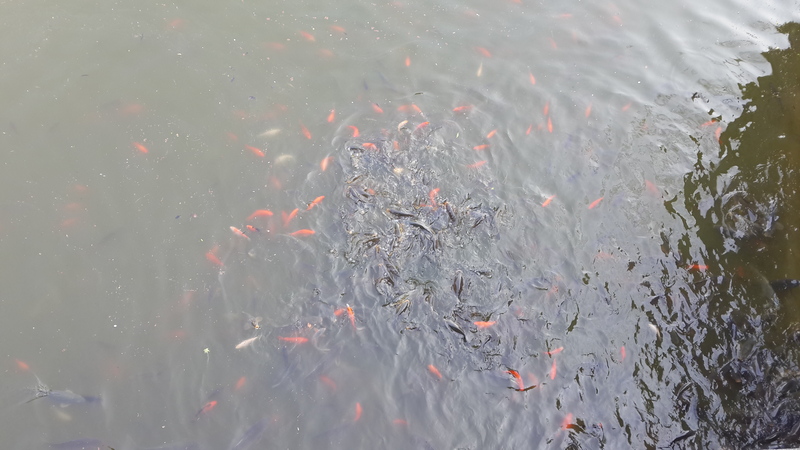 The pond was also filled with Koi fish, some of which were MASSIVE. 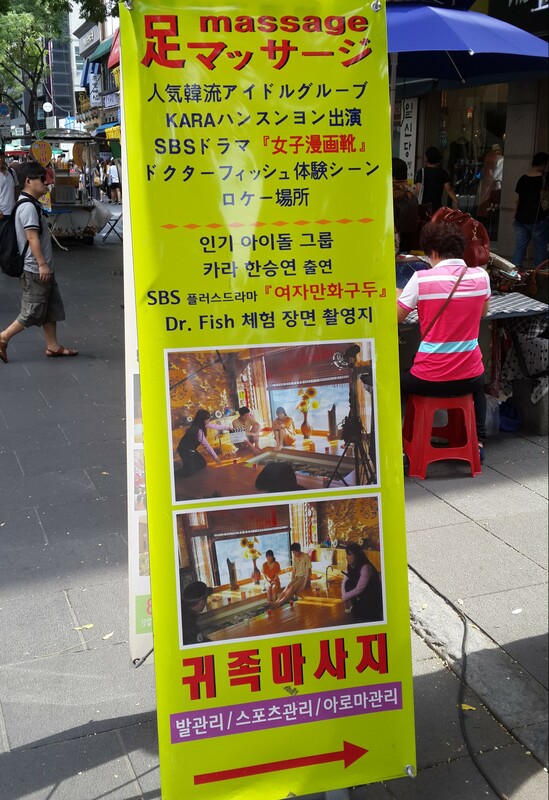 One interesting thing that I had not seen before, was the machine with fish food for sale. 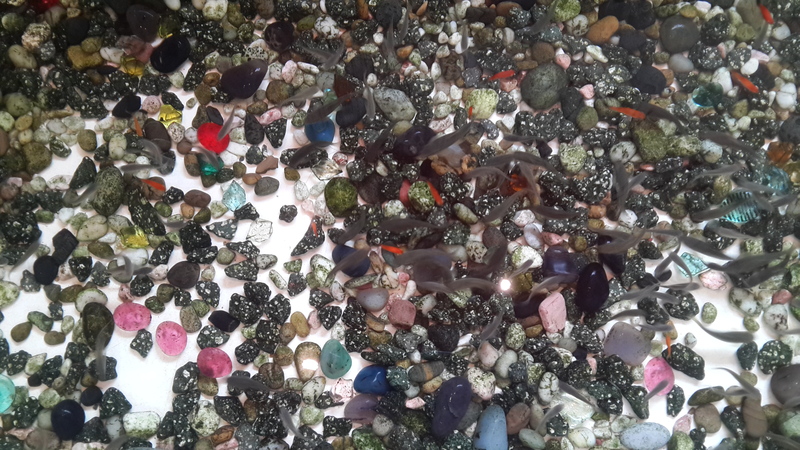 50cents bought you a small cup of fish food pellets. When you tossed them into the water, the fish freaked. 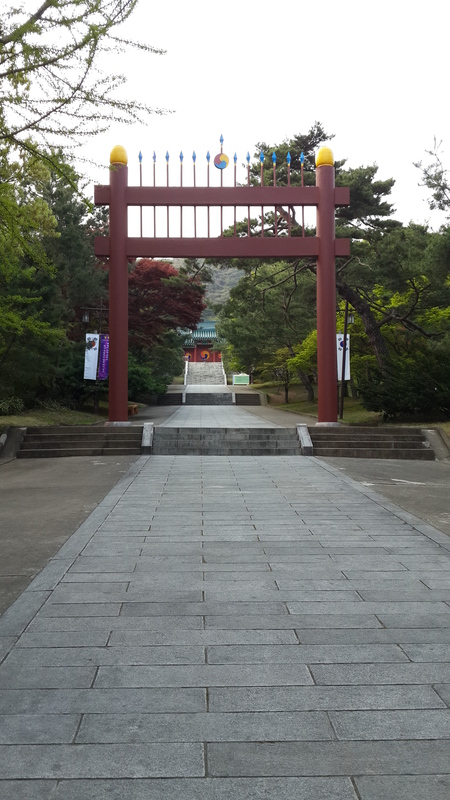 When we got to the shrine, it was up a big hill, and the gate looked closed, and no one else was around, so we just took some pictures and headed home. On the way back to the subway station, we decided to take the bus, which was a much better idea than walking. And we should have done that on the way there. But all in all, it was a great way to spend the afternoon. Really beautiful. The air was clean and it was great to get out into nature a little bit. 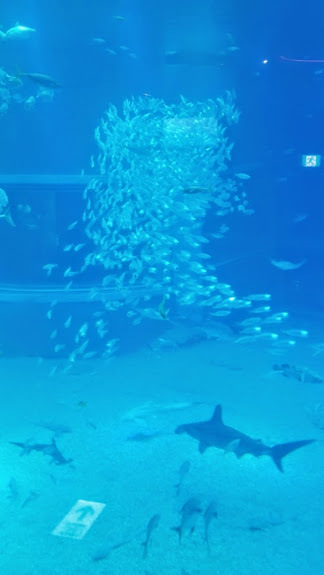 My first stop on my summer holiday in Japan was to Kaiyukan Aquarium in Osaka. 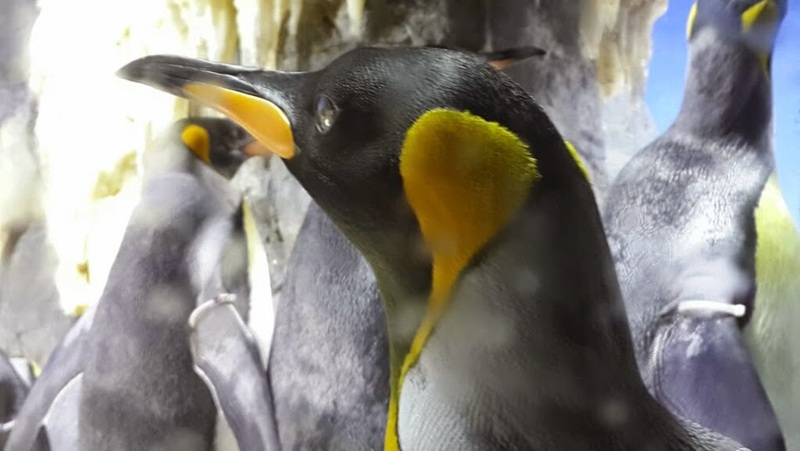 I was really excited to visit Kaiyukan for several reasons. 1) I really like aquariums. I feel like the ocean is as close as we can get to space on earth, and I REALLY like space. (does that make sense?) But in a way, it is a completely different environment than what we experience on land, with a completely different life forms. And in terms of what we know about it, the ocean is huge, and what we know is not that big. 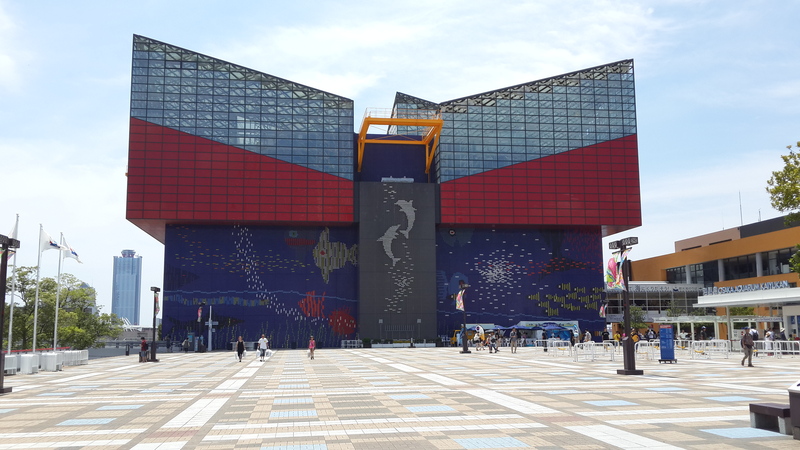 2) Kaiyukan is famous for being one of the best aquariums in the world. and 3) I actually taught a lesson about Kaiyukan to my students. So I was filled with all sorts of strange facts about the aquarium. Osaka is really well set up for foreign tourists. A lot of information is available in English, and the people are really helpful if you’re looking particularly lost. (Thanks lady who showed me how to use the subway ticket machine!!) So I was quickly on my way out to the aquarium. Walking up to Kaiyukan, you first see the Tempozan Ferris Wheel. 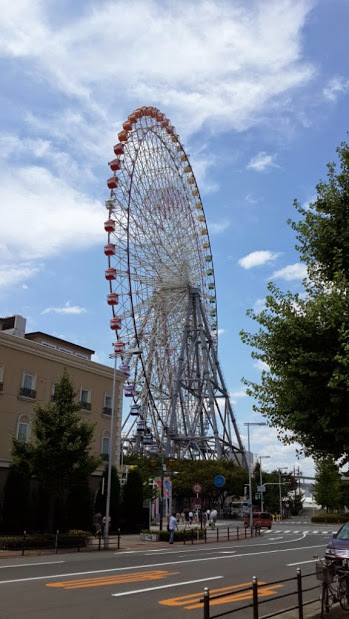 The reason you see the Ferris wheel first is that it is HUGE. And is it just me, or does it look like it’s tilting, just a bit? Needless to say, I didn’t spend the $7 to ride it. Just next to it is KAIYUKAN! One of the largest aquariums in the world!! 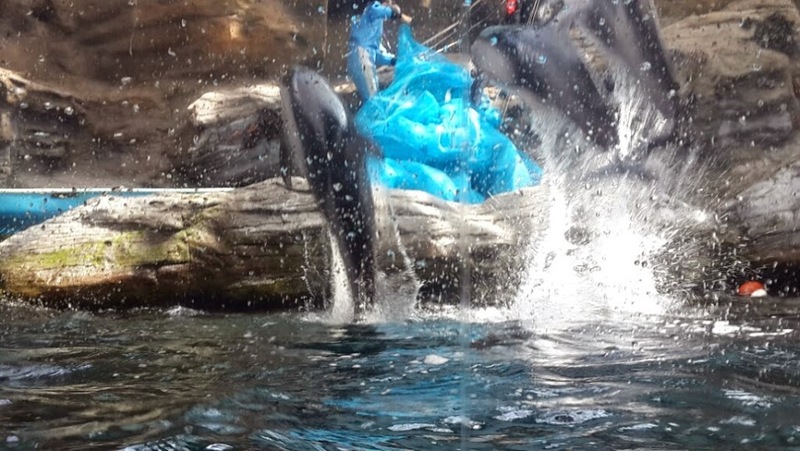 The dolphin feeding time was really more like a mini dolphin show. They had one handler/feeder per dolphin and they jumped in and brought the dolphins up close to the glass and did small tricks with them. The main woman talked a lot, and explained a lot about the dolphins. I think. It was in Japanese. 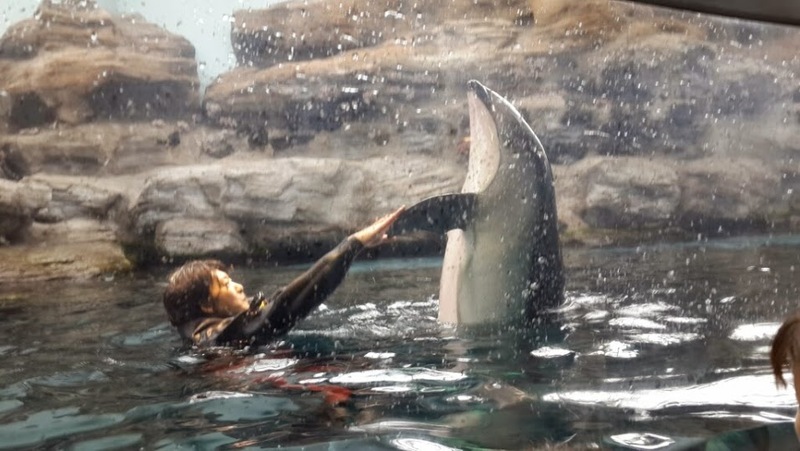 Now everyday I have will be, ‘well it was a good day, but it wasn’t a ‘high fiving a dolphin’ kind of day.” You could also really tell when feeding time was about to happen, because the animals started freaking out. Especially the dolphins. They were all calm, just swimming swimming, and then the women came out and they were jumping all over the place. They were like popcorn they were so excited. That’s how I look when someone brings out food too. 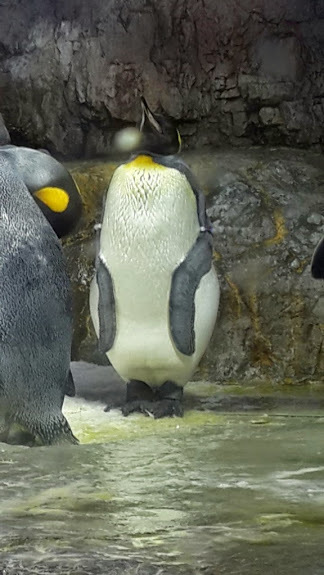 My favorite penguin just stood there the whole time, staring at the ceiling. Looking back on it, I’m slightly afraid it may have been stuffed, or a dummy penguin. 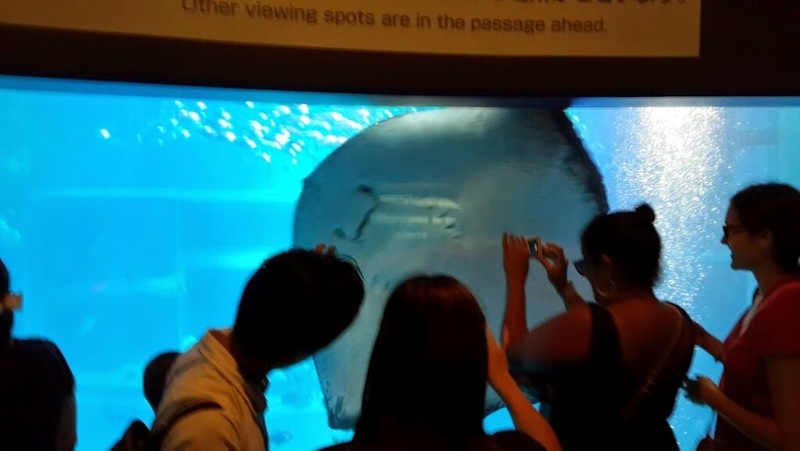 I love that rays look like they have little happy faces. 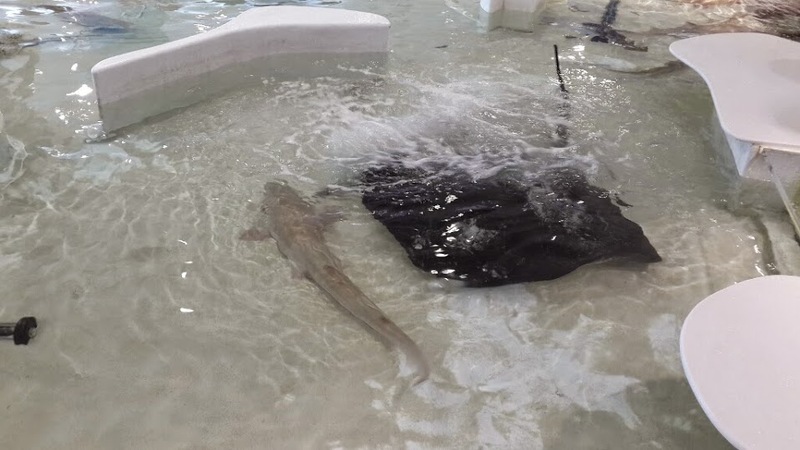 The rays are in the main tank of the aquarium, which is huge. 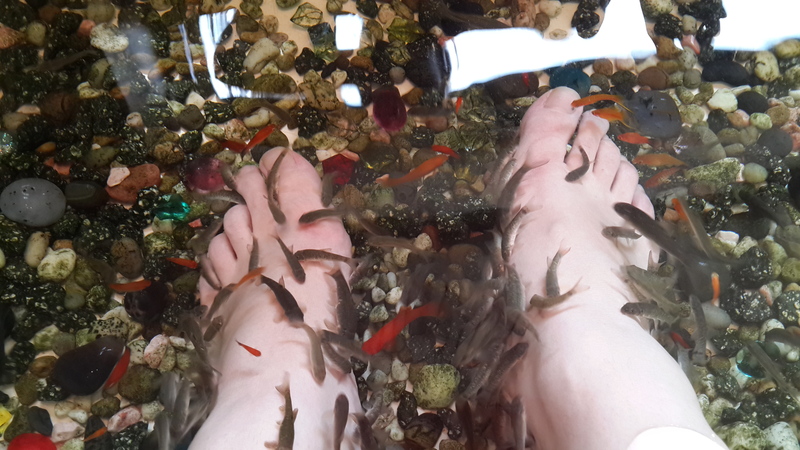 As I said you walk around it, and it is about three stories tall, so you see a lot of fish. This is where I would be writing about how @**)@*@^!% big the whale shark is, but alas, the whale shark was not out that day. (Where do you keep a WHALE SHARK, when it’s not in the giant tank, I wonder.) Instead there were spotted eagle rays, and sting rays, and hammerhead sharks… and lots of other fishy- things. My favorite thing about the tank was how different it seemed just from looking at it from the top or bottom. You notice totally different things. On the bottom, it’s all about the sharks and some of the rays, but up at the top there are more fish, and a whole school of fish that seemed to spend all of its time just avoiding the sharks. 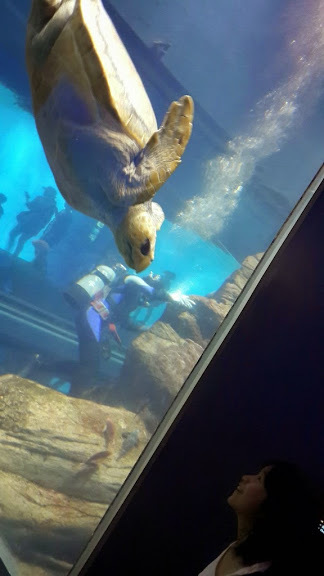 There was a sea turtle that legitimately looked like it was flying. Also, behind Mr. Sea Turtle, you can see a diver. Cleaning. This was a common site at Kaiyukan. The aquarium was very clean, both in and out of the tanks. Several times I saw people cleaning. It was nice to see. 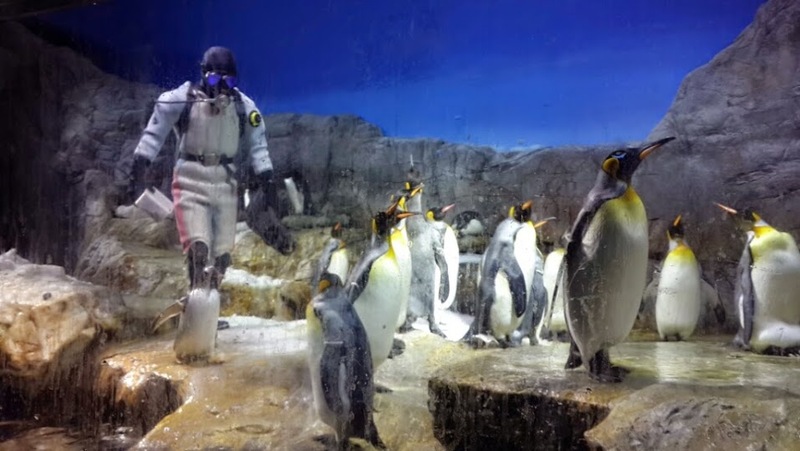 I’ve been to a few aquariums… and I was definitely impressed by the habitats in Osaka. They were all large and clean. Most of them were modeled to look really realistic. Which was all very nice to see. I have been to aquariums and zoos where all the animals looked unhappy and the cages/tanks too small… this wasn’t like that. And I was also happy to see the interaction between the employees and the animals. They seemed to genuinely enjoy and care for them. Now, to be very clear, I think crabs are delicious. But I really don’t like looking at them. They seriously creep me out. And I really want to meet the first guy that ate crab meat. Because seriously. Who looks at a crab and thinks… ‘ooo yummy.’ They’re all spindly looking… and shell-y. I mean, it just doesn’t look appetizing. 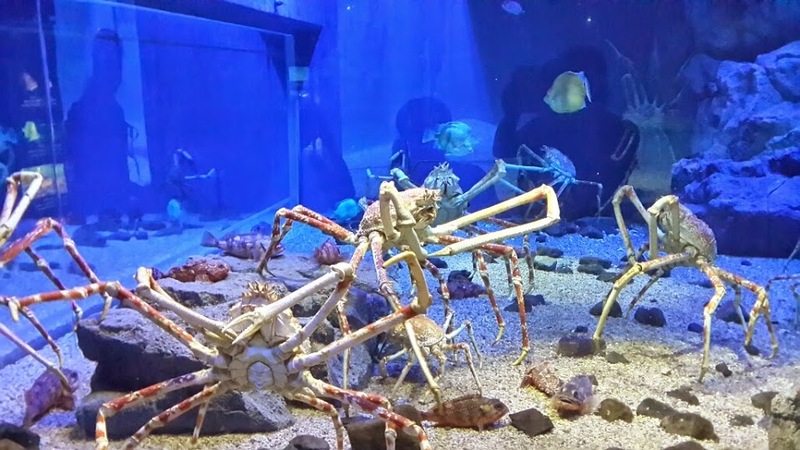 The only thing in aquariums that I like less than a crab tank is a GIANT CRAB TANK HIDING BEHIND A CORNER, SO YOU CAN’T PREPARE YOURSELF FOR WHAT YOU ARE ABOUT TO SEE. At this point I was kind of bummed that there were no jellies. 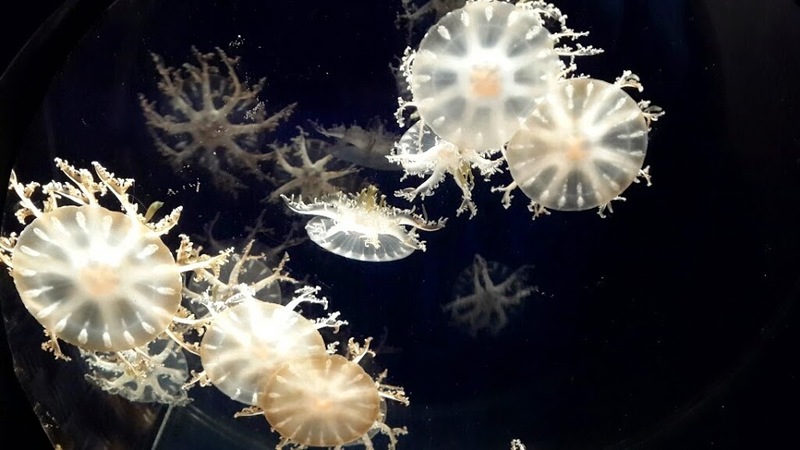 Jellyfish are my favorite thing to see at the aquarium. And I thought an aquarium of this stature would at least have a jelly or two. 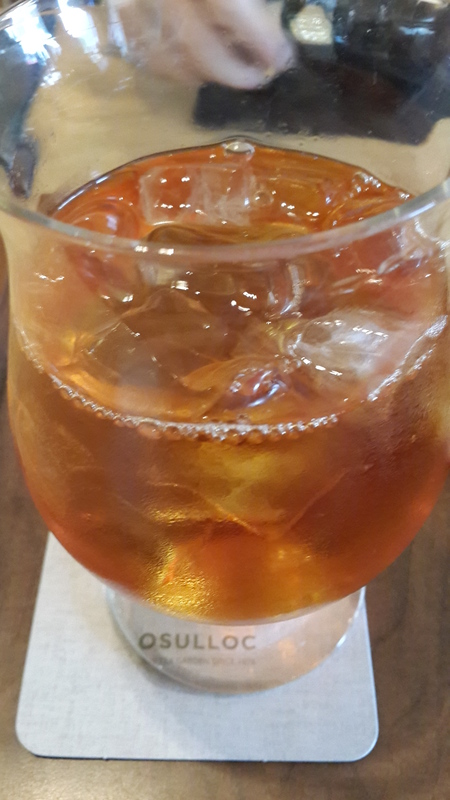 And then joy of joy, I came to the jelly room! 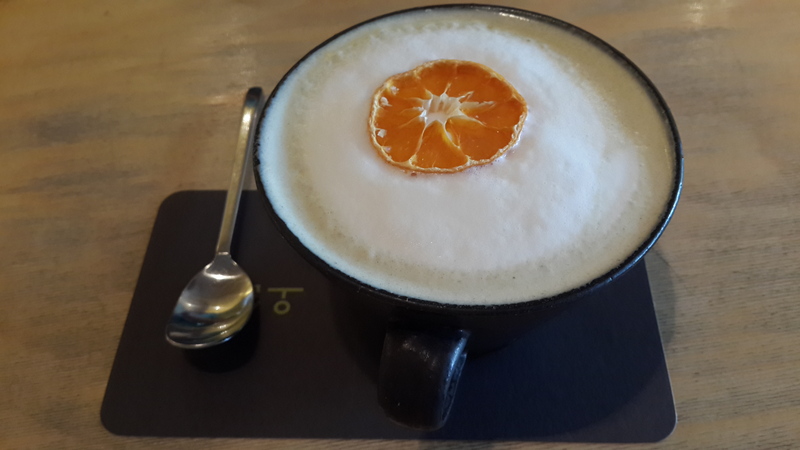 Important to note that the white part of that last one there is bigger than my head. Also important to know, these giant jellyfish are eaten in some places. So after the excitement of the Jellyfish room, I was not expecting even more excitement. But more excitement there was. A touch pool!! With… sharks and sting rays? Rad. This is one of those times in my life that I have to remind myself that I’m an adult, and that it’s not appropriate to push small children out of the way. No matter how excited I am. 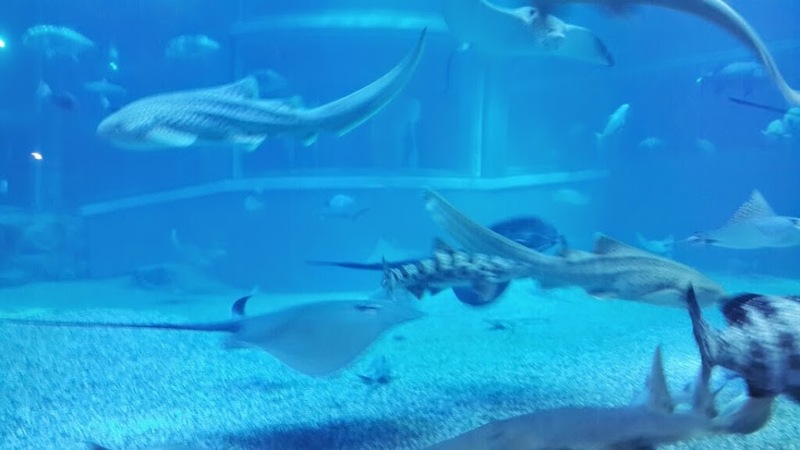 But, I petted the shark and the ray, after waiting my turn like a responsible adult. Extra points go to the mom next to me though. 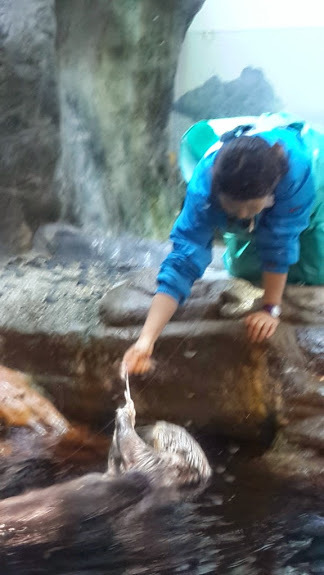 Her daughter was really young and couldn’t really reach any of the fish. So she held her by both of her braided pigtails and the little girl leaned way over the edge to touch a shark. And then Mom pulled her back up. It took me about 4 hours to walk around the aquarium. Definitely a fun way to spend an afternoon. Definitely worth going to if you find yourself in Osaka with nothing to do. 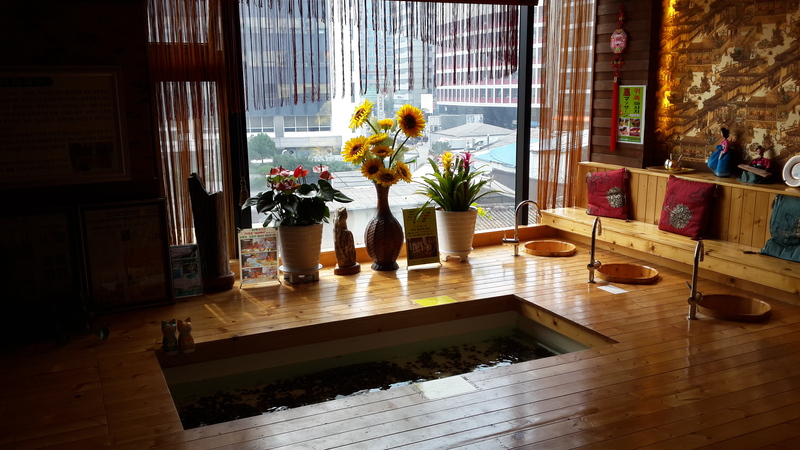 Or even if you find yourself in Osaka with lots of things to do, make sure Kaiyukan is on the list!